First of a three part series, The Union Effect in California. Unions have historically played a role in improving wages and benefits by enabling workers to join together to negotiate with employers. Recent research finds a persistent positive effect of unions on members’ wages and household income (Farber et al. 2018). On their own, individual workers have little bargaining power with employers. When bargaining together, workers have raised not only their own wages, they have also helped to set higher standards that improve wages for union and non-union workers alike (Bivens et al. 2017). Income inequality in the United States has risen as the share of workers covered by a union contract has declined (Farber et al. 2018). Workers covered by a union contract in California earn an average of 12.9 percent more than non-union workers with similar demographic characteristics and working in similar industries. Overall, we estimate that unions increase workers’ earnings in California by $18.5 billion annually through collective bargaining. Unions increase the likelihood that a worker will receive employer-sponsored health insurance by 37.2 percent, compared to non-union workers with similar demographic characteristics and working in similar industries. We estimate that 670,000 more Californians have health insurance through their employer as a result of collective bargaining in California. Unions increase the likelihood a worker will be offered a retirement plan on the job by 51.5 percent, compared to non-union workers with similar demographic characteristics and working in similar industries. We estimate 830,000 more Californians are offered retirement plans due to collective bargaining in California. Unions decrease by 37.1 percent the likelihood of a worker living in a low-income family, compared to non-union workers with similar demographic characteristics and working in similar industries. By organizing and bargaining collectively, union workers are able to significantly improve their wages, benefits, and working conditions. For many Californians, unions are an important pathway to the middle class. In what follows, we detail the findings of our analysis of Current Population Survey data for California. Union workers have higher average earnings than non-union workers. Part of this difference is due to union coverage, and part to the fact that the two groups of workers are different in terms of their age, experience, educational attainment, and the industries in which they work (see Appendix 1). In order to estimate the wage difference attributable to union coverage, we use a regression model to control for industry and worker demographic characteristics (see Appendix 2 for a detailed description of data sources and methods). We estimate that workers covered by a union contract in California earn 12.9 percent more on average than non-union workers with similar demographic characteristics and working in similar industries (see Table 2). 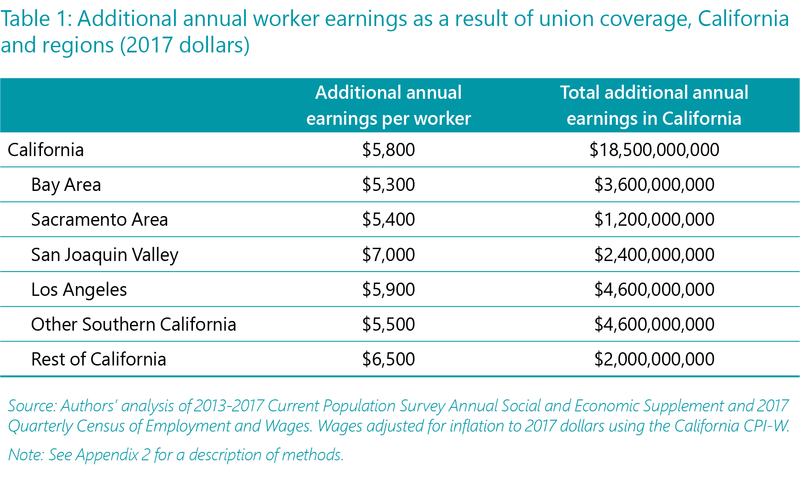 Our estimate of the union wage premium understates the full impact unions have on wages in California. Research has shown that unions also lift wages for non-union workers by setting wage standards across industries and sectors, and by advocating for policies such as the minimum wage. The state and multiple California cities and counties raised the minimum wage in recent years, thereby increasing earnings for many non-union workers and reducing the difference between union and non-union worker wages (Bivens et al. 2017; Walters and Mishel 2003). Union workers are more likely to receive employment-based health insurance than their non-union counterparts. Figure 1 shows that in California, 77.1 percent of union members reported participating in an employment-based health plan between 2013 and 2017 compared to 49.4 percent of those not in a union. Again controlling for differences in industry anwd worker characteristics, we estimate that workers covered by a union contract are 37.2 percent more likely to have health coverage through an employment-based plan than their non-union counterparts, as shown in Table 2. We estimate that 670,000 more Californians have health insurance as a result of collective bargaining in California (see Appendix 2 for a detailed description of our methods). California’s union workers also pay a lower share of premiums on average than their non-union counterparts and have plans with lower deductibles (Whitmore and Gabel 2017). The differences in availability of health care plans on the job combined with higher wages translates into lower usage of California’s public health care programs. We estimate that 31.6 percent of non-union workers in California are enrolled or have a family member enrolled in Medi-Cal, California’s Medicaid program, compared to 19.5 percent of union families. As shown in Table 2, we find that union workers are 30.9 percent less likely to be in a family where at least one member is enrolled in Medi-Cal, compared to non-union workers with similar demographic characteristics and working in similar industries. Defined benefit pensions provide guaranteed lifelong retirement income to retirees and are managed by professionals. Defined contribution plans, such as 401(k)s, are individual investment accounts in which workers bear all investment risk as well as the risk of outliving their savings. Union members are less likely to earn low wages and live in low-income families (defined as family incomes less than 200 percent of the federal poverty line, or FPL). In California, 24.3 percent of non-union workers are in low-income families compared to 11.2 percent of union workers. Controlling for industry and worker characteristics, we estimate that workers covered by a union contract are 37.1 percent less likely to have family incomes under 200 percent FPL than their non-union counterparts, as shown in Table 2. With higher incomes and greater access to benefits, union families are less likely to need to rely on public safety net and health insurance programs to meet their basic needs. In this report we analyze the three largest programs providing income assistance: Supplemental Nutrition Assistance Program (SNAP), the Earned Income Tax Credit (EITC), and Temporary Aid to Needy Families (TANF) cash assistance. We estimate that 27.8 percent of non-union workers are in a family relying on one or more of these programs, compared to 17.5 percent of workers covered by a union contract. Comparing similar workers in similar industries, we estimate that union workers are 30.6 percent less likely to be in a family that relies on a public safety net program than their non-union counterparts, as shown in Table 2. This report uses the Current Population Survey (CPS) for California. Specifically, we use the Economic Policy Institute CPS Outgoing Rotation Group (ORG) files (2013-2017) for our hourly wage estimates and the IPUMS CPS Annual Social and Economic Supplement (ASEC) (2013-2017) for estimates of health and retirement benefits and low-income status. We use the National Bureau of Economic Research CPS ASEC (2014-2015) for estimates of public safety net program and Medi-Cal enrollment. In all of our analyses, the sample is restricted to employed wage and salary workers age 18 to 64 who live in California. For wage estimates, we further restrict our sample to exclude observations with imputed wages. We define union workers as those who are either members of a union or covered by a union contract. We estimate the adjusted union wage premium using ordinary least squares regression of log wages on union status and include controls for age, age squared, two-digit industry, education, race/ethnicity, gender, marital status, nativity, year, and region within California. We then exponentiate the coefficient on union status and subtract one to convert from log points to a percent estimate. Wage premium estimates are based on analysis of pooled 2013-2017 data. To estimate the additional dollars paid to workers as the result of a union contract, we first use our regression equation to estimate the hourly wages of individual union workers under the counterfactual scenario that they were not covered by a union contract. We then construct annual earnings estimates for union workers based on (1) their actual hourly wage and (2) their predicted hourly wage in the counterfactual scenario where they were not in a union. For both measures, we multiply the hourly wage by the worker’s usual weekly hours and by the average weeks worked per year for union workers in California, as estimated using the CPS ASEC for 2013-2017 (48.5 weeks). Next, we subtract the predicted annual earnings of union workers under the counterfactual scenario from their actual annual earnings to get the additional dollars earned as a result of having a union contract. The average difference across all union workers is then multiplied by the number of union workers in California, estimated by applying the California union density estimate from the CPS ORG 2013-2017 to the 2017 count of California workers from the Quarterly Census of Employment and Wages. We use the Quarterly Census of Employment and Wages because it is a more accurate source for employment counts than the Current Population Survey; as a result our estimated number of union workers in California is higher than in Hirsch and McPherson (2018). To arrive at regional estimates, we replicate this analysis within each region. Adjusted estimates for health and retirement benefits, low-income status, and use of public safety net programs were estimated using logit regressions and include controls for age, age squared, major industry, education, race/ethnicity, gender, marital status, nativity, and year. We report the percentage difference in the marginal effects for union workers, estimated with and without the estimated union effect. 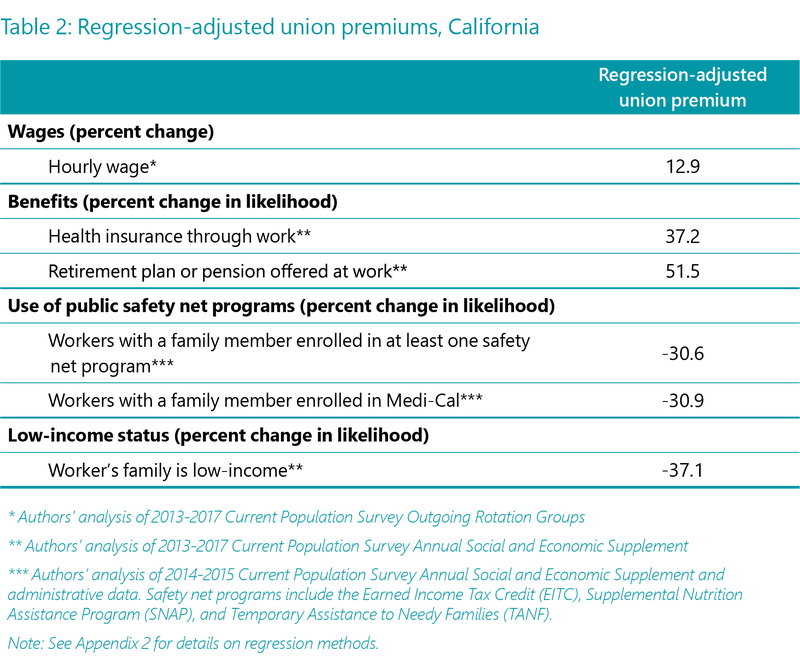 To estimate the additional number of workers in California who have employer-sponsored health insurance or are offered a retirement plan by their employer, we multiply the number of union workers in California (estimated by applying the California union density estimate from the CPS ORG 2013-2017 to the 2017 count of California workers from the Quarterly Census of Employment and Wages) by the percentage-point difference between our regression-adjusted estimates of the proportion of union and non-union workers with the benefit. Benefits and low-income status estimates are based on analysis of pooled 2013-2017 data, and use of public safety net program estimates are based on analysis of pooled 2014-2015 data. Bay Area includes Alameda, Contra Costa, Marin, Napa, San Benito, San Francisco, San Mateo, Santa Clara, Solano, and Sonoma Counties. Los Angeles includes Los Angeles County. Southern California includes Imperial, San Bernardino, San Diego, Orange, and Riverside Counties. Sacramento Area includes El Dorado, Placer, Sacramento, and Yolo Counties. San Joaquin Valley includes Fresno, Kern, Kings, Madera, Merced, San Joaquin, Stanislaus, and Tulare Counties. Rest of California includes all other counties in California. These estimates are from the National Compensation Survey, an employer survey that yields higher coverage rates than the Current Population Survey. Bivens, Josh, Lora Engdahl, Elise Gould, Teresa Kroeger, Lawrence Mishel McNicholas, Zane Mokhiber, Heidi Shierholz, Marni von Wilpert, Valerie Wilson, and Ben Zipperer. 2017. “How Today’s Unions Help Working People: Giving Workers the Power to Improve Their Jobs and Unrig the Economy.” Policy Brief. Washington, D.C.: Economic Policy Institute. https://www.epi.org/publication/how-todays-unions-help-working-people-giving-workers-the-power-to-improve-their-jobs-and-unrig-the-economy/. Bureau of Labor Statistics. 2017. “Table 2. Retirement Benefits: Access, Participation, and Take-up Rates,1 Civilian Workers,2 March 2017.” https://www.bls.gov/ncs/ebs/benefits/2017/ownership/civilian/table02a.pdf. Farber, Henry S., Daniel Herbst, Ilyana Kuziemko, and Suresh Naidu. 2018. “Unions and Inequality Over the Twentieth Century: New Evidence from Survey Data.” Working Paper 24587. National Bureau of Economic Research. https://doi.org/10.3386/w24587. Hirsch, Barry T., and David A. MacPherson. 2018. “Union Membership and Coverage Database from the CPS (Unionstats.Com).” 2018. http://www.unionstats.com/. Walters, Matthew, and Lawrence Mishel. 2003. “How Unions Help All Workers.” Economic Policy Institute. https://www.epi.org/publication/briefingpapers_bp143/. Whitmore, Heidi, and John Gabel. 2017. “California Employer Health Benefits: Prices Up, Coverage Down.” California Health Care Foundation. https://www.chcf.org/publication/california-employer-health-benefits-prices-up-coverage-down/. We thank Sylvia Allegretto, Annette Bernhardt, Dave Graham-Squire, Sara Hinkley, Jenifer MacGillvary, Carl Nadler, Katie Quan, and Nari Rhee for their invaluable advice and feedback. We also thank Ian Perry and Gabriel Sanchez for assistance with data analysis. Ken Jacobs is chair of the UC Berkeley Center for Labor Research and Education. Sarah Thomason is a research and policy associate at the UC Berkeley Center for Labor Research and Education. Jacobs, Ken and Sarah Thomason. 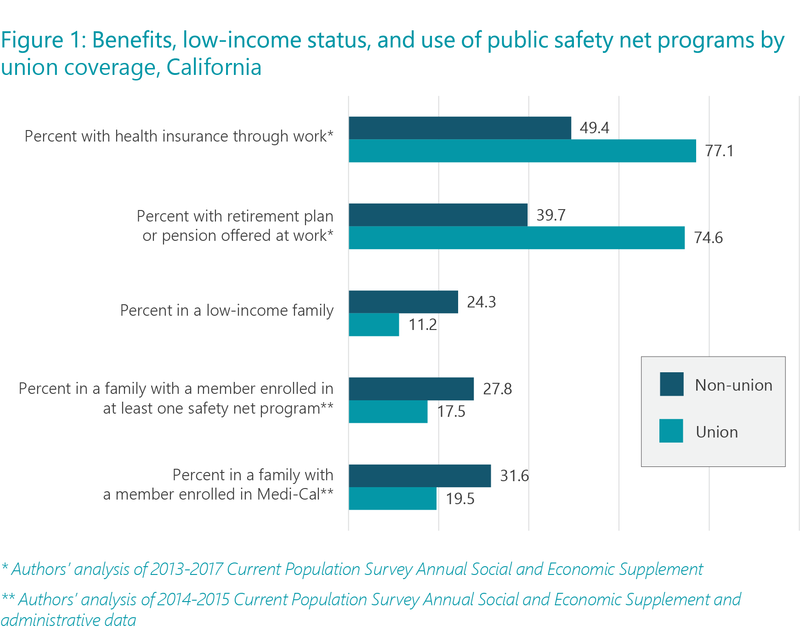 The Union Effect in California #1: Wages, Benefits, and Use of Public Safety Net Programs. Center for Labor Research and Education, University of California, Berkeley. May 2018. The analyses, interpretations, conclusions, and views expressed in this brief are those of the authors and do not necessarily represent the UC Berkeley Institute for Research on Labor and Employment, the UC Berkeley Center for Labor Research and Education, the Regents of the University of California, or collaborating organizations or funders.